To access these collections, click on the icon below and register: you are required to register here before most aps will work. After registering download rbdigital app to your device! 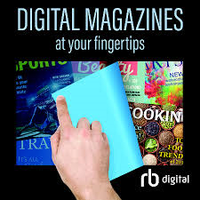 The Bellaire Public Library has purchased the following audiobooks collections, digital magazines collection, and Transparent Language collection. After you register for the above service you can access the following links. Click on the icon to access each one. You must also register at these locations. Follow the appropriate link for your device below. After you select a language lesson, in the upper right corner of the page, find "GO MOBILE" and you will be prompted via a pop-up window.